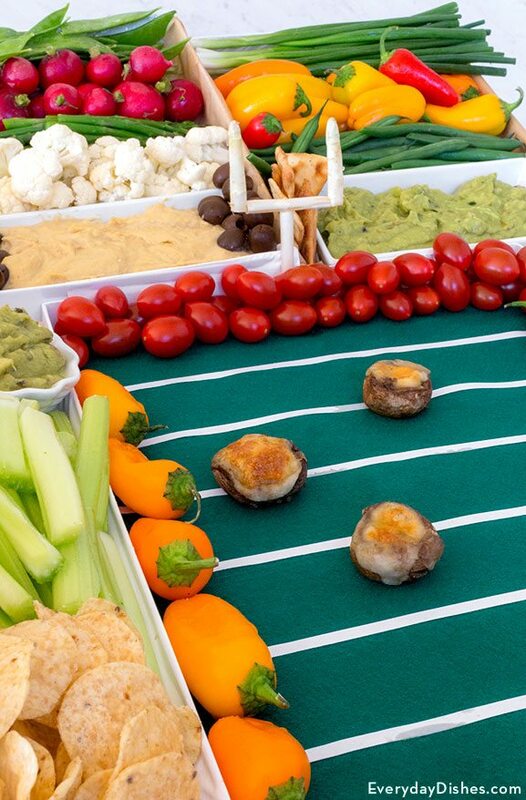 Celebrate the ultimate event in American football with our vegetable football stadium setup. Select your favorite vegetables, dip and miscellaneous finger foods then arrange the ‘stadium’ according to our easy-to-follow instructions. We used gift boxes to arrange the ‘stadium,’ but you can easily get creative with any kind of storage container that works for the size of your guest list. White duct tape will securely hold the pieces together! 1 large flat box about 12" x 18"
1 medium flat box about 9" x 15"
1 small flat box about 8" x 11"
green felt about 12" x 18"
All boxes and lids should be 1"–2" deep. Do not worry if the large box is deeper than 2" because you only need to use the lid. To protect the boxes for reuse, cover the insides with plastic wrap the cover with parchment paper. The lid to the large box will be the ‘field.’ Cover the entire bottom with the green felt after you have created yard lines with the white tape. The medium box bottom and lid will be the sides of the stadium. Place something sturdy like a brick under each of the boxes to tilt them toward the ‘field.’ Use duct tape along the entire length of the boxes where they touch to strengthen the structure. Cover the bricks under the ‘stadium’ with kitchen towels. Use the small lid and box to form the ‘end zone’ of the ‘stadium’ in the same way. We left one ‘end zone’ empty to make it easier to get to the food, but feel free to enclose the entire ‘stadium’ if you wish. Now it is just a matter of filling the ‘stadium’ with your favorite finger foods. We had a Red team and an Orange team. The Red sideline has small red peppers and a cherry tomato ‘end zone.’ The Orange team has small orange peppers on the sideline and baby carrots in the end zone. Use toothpicks to form and secure the ‘goal posts.’ Ours are white asparagus but you could use breadsticks or thin sausages. The ‘players’ on the field are stuffed mushrooms. Fill the stadium with chips, dips, salsa, hummus, raw veggies, sliced wraps, crackers, cheese…whatever you like! GO TEAM! Green felt and parchment paper will help the décor look more on-point!